This tiny chameleon is one of the smallest living reptile species, and one of the smallest vertebrates. Brookesia micra is the scientific name of this newly discovered species. Full grown Brookesia micra grow to barely an inch from head to tail, taking the title of smallest reptile away from the Jaragua Sphaero Gecko. 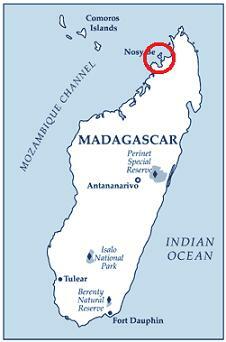 The tiny lizard was found in a small area called Nosy Hara which is considered part of Madagascar. This awesomely small discovery was made by a team of researchers from San Diego State University. Scientists say that its small size is an adaptation caused by the need to reproduce faster, and the fact that it has such a small area to live in with dwindling resources. So if we humans keep all this deforestation up we can look forward to tons of smaller cuter versions of animals that provide us with a stable Eco system. Good job guys keep up the good work. Nosy Hara(circled in red) where this chameleon was discovered.